At the presentation of the project ‘Sigmasoles: innovation in photovoltaic concentration in Spain’ by the Institute of Concentration Photovoltaic Systems (ISFOC) yesterday in Puertollano, the Deputy Regional Minister of Science and Technology, Enrique Díez Barra, highlighted the Regional Government’s commitment to renewable energies. This project, co-ordinated by ISFOC, aims to improve the current situation of concentration photovoltaic systems in Spain, through joint work and collaboration of industry, research centres and laboratories. Together with the University of Castilla-La Mancha and the companies Soldaduras Avanzadas and Ingeteam, based in Castilla-La Mancha, two more universities also participate in the project: University of Jaé n and the Polytechnic University of Madrid, the companies Abengoa Altran, BSQ Solar, Guascor, Isofoton, LPI, Sener and Teknia, as well as the research and technology centres INTA, CENER and CIDETEC. The Government of Castilla-La Mancha has supported this project by co-financing it along with the Spanish Ministry of Science and Innovation, due to its uniqueness. It is an emerging and strategic technology. Thanks to this centre, Castilla-La Mancha and Spain became word references in this technology’, the Regional Minister said. According to him, Castilla-La Mancha should offer, in addition to the production of energies (where we are at the top in renewable energies) the capacity to create knowledge and technology. ‘That is the condition to achieve a stable, competitive and long-term production model, as set in Castilla-La Mancha’s Pact’. Díez Barra stressed the commitment of Barreda’ s Administration to science and technology. This commitment can be seen in the continuous increase of funds allocated to R&D in regional budgets and in the agreements with the Government of Spain, in projects such as ISFOC. ‘It’s very satisfying to see how researchers and companies in Castilla-La Mancha are responding to the initiatives taken by the Government, making our growth rate of investments in R&D the highest in Spain for two consecutive years’. The first deputy mayor of Puertollano, Antonio Rodríguez, highlighted the town’s historical commitment to progress and technological development, specifically the one linked to the energy in its various forms. He also highlighted that now more than ever a boost to renewable energy is needed. ISFOC’s Director, Pedro Banda, presented the various aspects addressed by the project: development of cells, optics, modules and followers, plant technology and production models. Banda stressed the importance of this project, which ‘arouses the interest of universities, research centres, technology centres and companies in Castilla-La Mancha, which are also some of the most important at national level’. 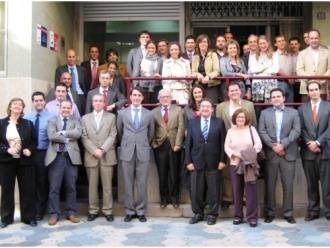 This project is being developed by a consortium of twenty Spanish companies, R&D institutes, agencies and universities. On this occasion, the consortium is meeting to evaluate the project results in its second year. The ISFOC is the co-ordinator of the Special Strategic Project ‘SigmaSoles, Innovation in concentration photovoltaic systems in Spain’. The project will be developed over the next four years. It receives a total funding of 4,461,200 euros for 2009 and 2010 through the Spanish Ministry of Science and Innovation, the Government of Castilla-La Mancha and the ERDF. The consortium has been formed with the participation of the companies Abengoa, Altran, BSQ Solar, Guascor, Ingeteam, ISFOC, Isofoton, LPI, Sener, Soldaduras Avanzadas and Teknia; the technology centres Cener and Cidetec, the public research institute INTA; and the University of Castilla-La Mancha, the University of Jaen and the Polytechnic University of Madrid. All these members do their best in the promotion of this sector in the various areas of work: manufacture, design, technology, market, research, development and engineering. The objectives are multiple and the areas of work include diverse industrial, market and development aspects of this technology. One of the areas of work focuses on developing high-efficiency solar cells and new optical concepts, which will lead to highly competitive and efficient concentration modules.